Kotti Berliner Döner Kebab might be a tongue full, but its kebab’s hit the right spot. 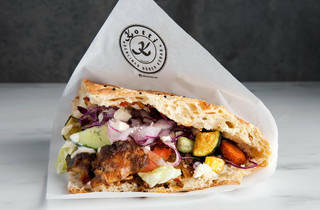 Sporting a long history within Berlin and Turkey, Kotti makes its mark at the DeKalb Market Hall with a bang. Not overshadowed by other excellent eateries, Kotti is able to stay continuously afloat with a simple but delicious menu. 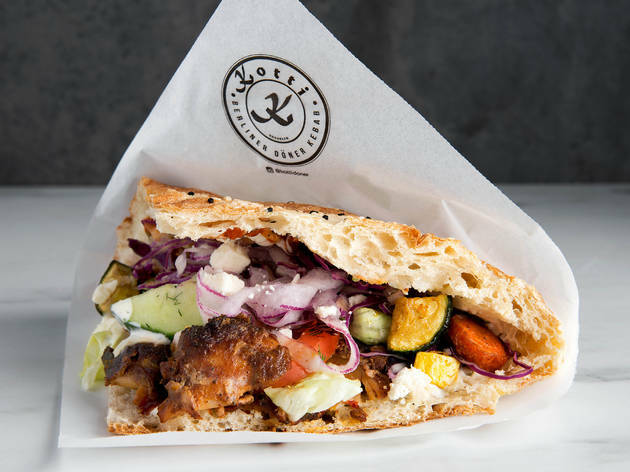 If you’re new to the kebab game, try the signature Kotti Berliner Döner Kebab ($14). Made with Turkish pide on focaccia-like sesame crusted bread. This meal takes you to another plane of existence. Every bite (while almost being overwhelming) confirms nothing but fresh ingredients prepared perfectly. Par that with a Club Mate ($5) and you’re set for lunch. One advantage that Kotti has above its competitors is quick service while maintaining high food preparation standards. Each kebab is made in front of display glass giving the anxious consumer a peak into the delicate, but precise construction. The toughest critic will have a hard time leaving with a bad impression since both the service and food are congenial. If you’re near Downtown Brooklyn check out this tiny eatery. We think you’ll leave with a smile. Wow, wow, wow!! Kotti is the best street food in town! We love it so much! Delicious! And excellent value for money! That moment when Berlin shows up in two different spaces in Brooklyn and you realize how awesome it is to live and eat in NY. . . that is the magic sauce of Doner Kebab. It's not just German. It's not just Turkish. It's fusion that shows a mouth what is up!